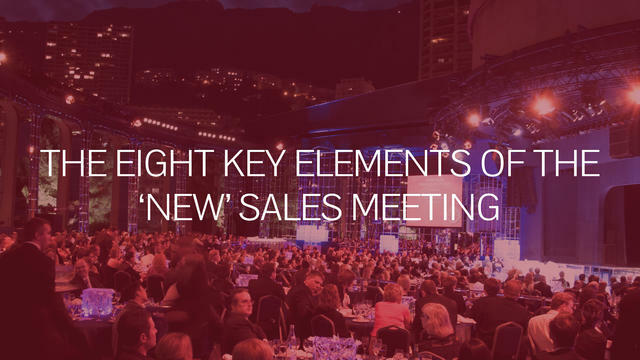 How mainstream trends, technology and generational influences are reshaping the sales meeting—and what you can do to reshape yours. They’re getting shorter. Edgier. Digital. 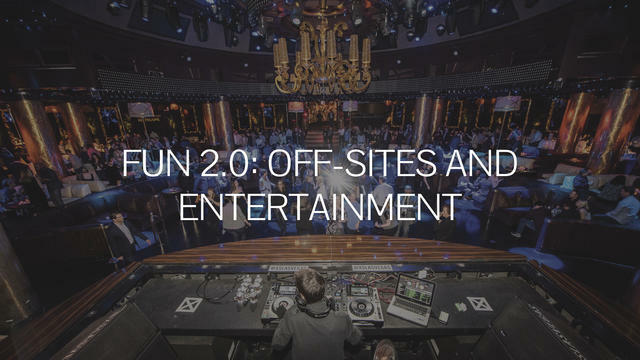 They’re incorporating b-to-c experiences, taking cues from the entertainment industry. And thanks to multigenerational influences, from millennials on up (with Gen Z just around the corner), they’re feeling more co-created, personalized and shareable. We’re talking about the sales meeting of the future, no longer your typical sit-down ballroom centric experience. 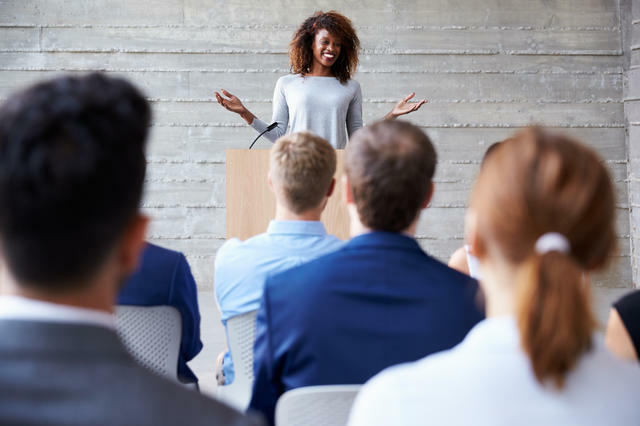 While the foundation of the sales meeting remains—to inspire, motivate and recognize—how the sales meeting acts, what it looks like and how it’s designed is evolving. And it starts with the attendees. The sales meeting of the future constantly evolves, extends beyond the event dates, balances company content with networking, and leverages technology and multi-level strategies to measure impact and engagement. And most importantly, it’s memorable. So where does the evolution begin? Read on. You know the traditional format of the sales meeting well: the opening reception, the keynote, the breakout sessions, the awards and, finally, the entertainment. But to keep pace with the needs of today’s sales forces, it’s time to think outside that box. 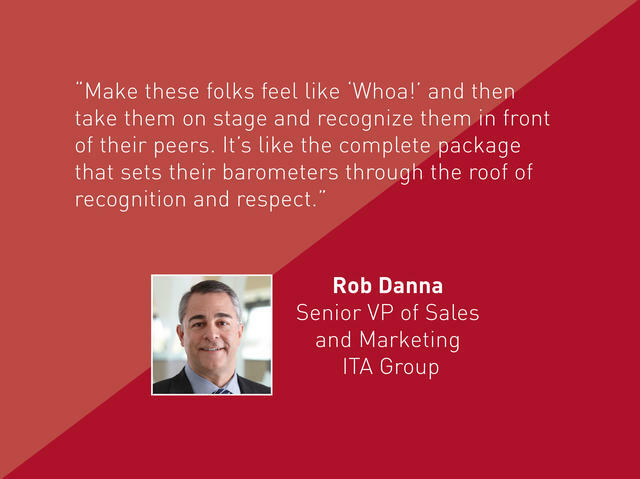 From the experts at ITA Group, a leading events, incentive and recognition engagement solutions partner, are eight ideas to modernize any sales meeting. The sales meeting is often the only time of year certain employees are face-to-face and able to meet peers and establish new contacts. The new sales meeting is less formal and places a stronger emphasis on peer-to-peer engagement with structured and unstructured networking opportunities. For a structure networking opportunity, you might assign a topic that was brought up but not able to be addressed in the formal sessions. 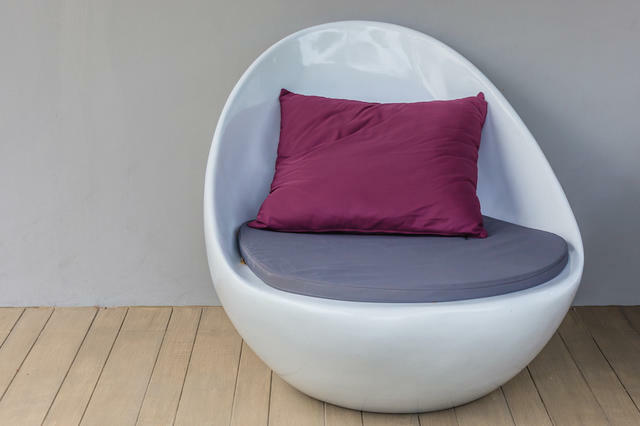 You might supply a relaxed environment and soft furniture and create a “breakout” discussion group. Throughout each day of the meeting, work in several 40 minute breaks for unstructured opportunities that give attendees the chance to go back to their rooms to think or grab a coffee with other attendees to meet, greet and discuss. "People will find productive ways to use those 40 minutes, so just give it to them," Danna says. "Get them talking. Get them participating and thinking outside the box. They're not just receptors—they're contributors." Meetings today have a mix of generations to consider and a one-size-fits-all approach is not going to give today’s attendees the flexibility they want in terms of how they absorb information. One way to make everyone happy is to let attendees decide how they’ll engage. Ditch lectures, mandates and PowerPoints. The next-gen attendee is accustomed to multisensory learning and quick hits of information, rather than the long form. Content in meetings is becoming more interactive with two-way dialogues and crowdsourced topics. “The recommendation we make is to gamify learning,” Danna says. “Sales people love to hear their own voice, so we’re going to enable that. Recognizing top earners remains a key element in the sales meeting formula. But the new sales meeting delivers a high-production-value, television broadcast-style awards program that is not only rewarding, it’s shareable and memorable. Aside from creative lighting, music and a lively presentation, consider some high-value additions like a “gifting suite” (Oscars-style), where top performers are treated like celebrities with a VIP lounge and the opportunity to pick out gifts for themselves and their families. Transform your keynotes or general sessions with broadcast techniques like ESPN’s “SportsCenter.” Offer the agenda in a dynamic side-screen ticker allowing attendees to follow along, know what’s coming next and anticipate content. Deliver the content with spark. Bring in a celebrity or expert to comment on a topic for 90 seconds. Move on to a different speaker. And so on. “People have such high expectations with what they get at home now, and anything short of that falls short,” Danna says. Sales professionals are competitive, which is why contests are natural tools to get attendees engaged and involved in the meeting. But don’t settle for corporate “Jeopardy.” Think big and think next gen—like video contests. An example: inviting attendees to film an elevator pitch, their value proposition. The top 10 videos are then played at the meeting and voted on. These allow contestants to inject their personalities, get creative and involve “celebrities” or well-known customers in their industry. The videos can be shared internally to amplify the contest. Other ideas: Fitness tracker steps contests, competitions for the best sales “access” letter to potential clients, and app scavenger hunt battles. Rethink how much air time you’re giving executives, and consider letting attendees have the stage. Recruit top earners to discuss their strategies and struggles. “You want to incorporate more storytelling, first-person success stories, as opposed to standing up and broadcasting a message,” Haines says. And don’t be afraid to weigh the “good” news with the “bad.” It’s about transparency. “I always say use the group to attack problems—win-loss analysis is critical to sales meetings and if we nail that part of the meeting, people will walk out of there feeling empowered, they’ll know the pitfalls and opportunities and what didn’t work here or there,” Danna says. Beyond recycling, compostable food storage and energy use, the new sales meeting is taking sustainability to the next level with the human factor: wellness. This includes intelligent menus that take into account food sensitivities, and considers options such as locally-sourced produce, which cuts down on carbon emissions and ups the nutrient intake. Planners are taking it a step further by considering how walkable a host city is, and offering daily fitness programs. Some of your best sales people are probably your most seasoned, which means they've seen it all when it comes to sales meetings. How can you keep your meeting fresh year after year, build excitement and make it the calendar "alert" of the year? Yep, this is a big one. Seek out a new city to host your meeting each year. While you’re at it, don’t settle for hotel meeting spaces or convention centers. Some of the hottest b-to-b venues are taking place in unexpected places that are adventurous, inspiration or downright fun. 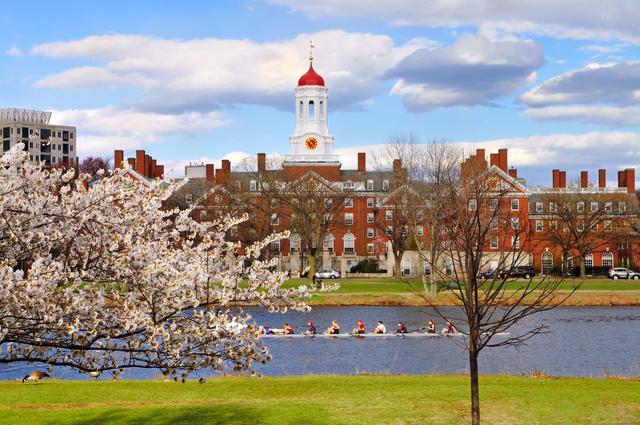 Like a college campus, which ITA Group leveraged for a client event, where sessions take place across campus and colleagues walk the green and enjoy college-style lunches. And then instead of keggers, of course, formal high-end evening events take place in different parts of the city. “It was unexpected, and it kept people moving and talking,” Haines says. Along with the venue, change up your meeting rooms by offering unexpected furniture or new floor plans. 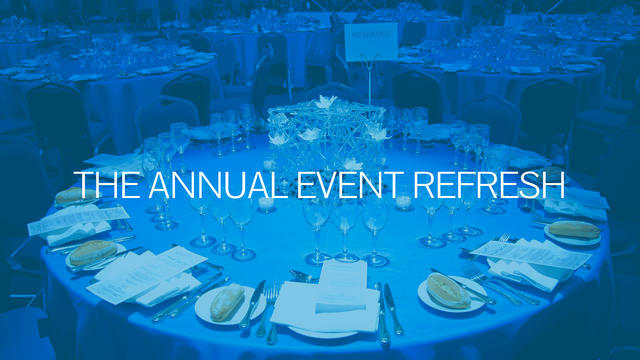 Attendees will remember what the meeting the prior year felt like, so give them something fresh. Ditch rows for circular tables, couches and high-tops. Let them put their feet up. “You want attendees to walk in and think ‘Wow, I can’t believe they thought of this,’” Haines says. You want to provide concise and strategic messaging that evolves each and every year. Rather than an ambiguous theme, consider something specific and strong like: “Selling in a Social Age,” says Danna. On top of that, make sure your event is well branded and consistent, and carries through from the initial communications, to the event and then in post event communications. Each meeting, strive to include a special component to the meeting that’s, frankly, a little bit different. Consider creating a technology-free zone that encourages face-to-face, uninhibited interaction. 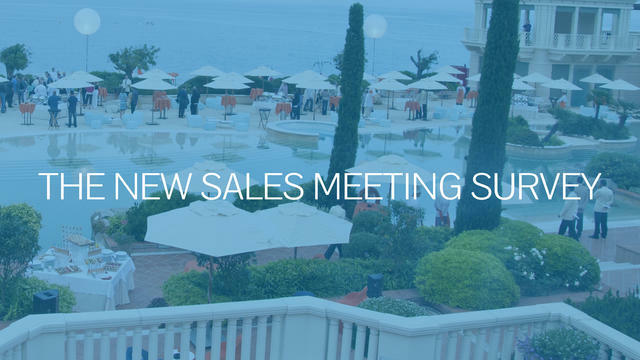 For its four-day Intel SKO sales event in Q1 each year, Intel widens the attendee list to include sales representatives and anyone who supports or works with sales to get results, from engineers to marketers. Each year, come up with one creative and personal way that executives or district managers can reach out to thank attendees for traveling and participating, and wish them well in the next quarter. Think hand-written notes or packages or envelopes waiting for attendees when they return to the office. Keep attendees guessing over who you’re going to invite next. “People are all after the ‘Insta-moment’ where later, they’re talking about this amazing sales meeting they went to where they had lunch with a famous athlete, for instance,” Danna says. And it doesn’t always have to be a Hollywood celebrity, he says. Bring out an “internal celebrity” like a developer who created the latest tool you’re selling, or the company’s best customer, or a customer your product has helped. As always, make sure that person has a connection to the message you’re trying to get across and the mission of the meeting. Sales representatives are distracted. They have clients to tend to. They’re on the phone. They’re on the road. And when that notice for the company’s annual sales meeting hits their inboxes, sometimes, it’s simply something to check off, rather than engage in. 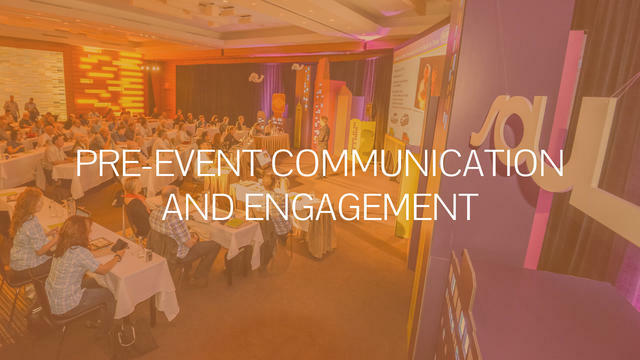 For meeting planners, the future pre-event communication strategy mirrors the approach with a consumer audience—you want to drive buzz, you want to offer supreme interest on-site, and then, you want to be able to follow up and reinforce the event messaging. 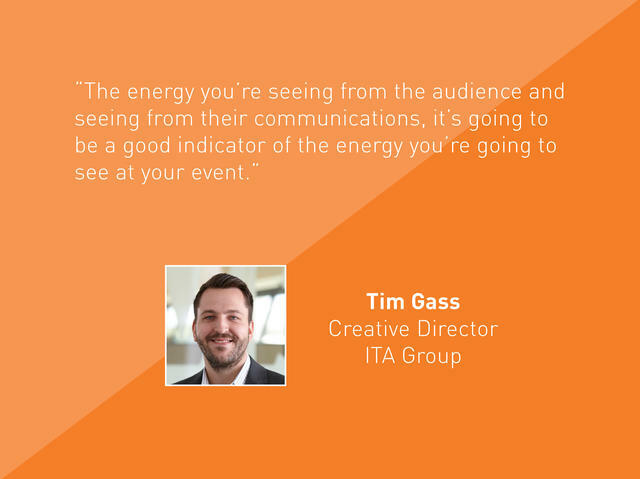 “With even the first communication, you want to make sure you’re instilling a sense of value and a sense of worth, and establishing relevance for the event,” says Tim Gass, Creative Director at ITA Group. "Part of that is thinking: what are your objectives, what is your value proposition and who is your audience, and once you have that framework, what's when you start adding the layers of communication to it." Pre-event communications for the new sales meeting must have a cross media approach with frequency and relevancy, Gass says. Years ago, he says, it was fashionable to declare “print is dead” and to rely on email solely to communicate with attendees. Not so anymore. Then comes the content of the communications. Aside from the hard facts about the event, you want to begin a dialogue, humanize the company and drive engagement through storytelling. Send pre-event communications that tell stories about the people who will attend the event, their success stories, or offer up profiles of new hires and key speakers. Your pre-event communications should also offer incentives. Perhaps you jump-start a regional competition before the event to gain attention and begin that dialogue, and encourage team-building. Offer prizes, special trips or dinners in the host city to the winners. Consider, too, crowdsourcing ideas for off-sites, activities and session topics, as another layer of pre-event engagement. 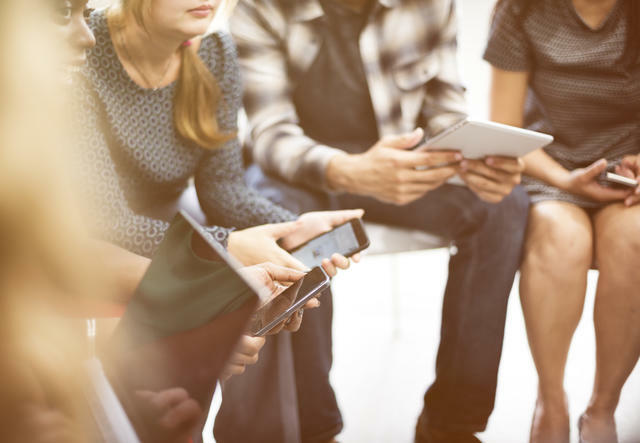 Through voting and suggestions, you’re tapping into the customization and co-creation principles millennials crave and the competitive spirit all sales representatives have. “At the end of the day, people react to and remember stories more so than they do facts or stats,” Gass says. The top tip here is to take an experiential approach, by giving attendees a taste of the destination they’re headed to for the meeting, whether it be through a video they can watch or delivering them a kit or package that serves as a welcome to the meeting destination with local spices, recipes or unique items from that locale. They can share this with their families or partners; it gets conversations going at home and in the office. And it builds anticipation. “Perhaps they start cooking with these ingredients that night, and already, they’re starting to build a memory of that meeting, a feeling and sentiment that will stay with them,” Gass says. Video is a powerful medium that is accessible from the palm of your hands. In meetings, video continues to bring dynamic dimension to keynote addresses. But that's hardly where video's true power begins and ends. Video recaps, Q&As, on-demand sessions and other video highlights should be distributed throughout your event's lifecycle, from pre-event communications to after the event to keep the momentum and interest high between one year and the next. The event app is not just a place to create and access meeting agenda. The app is essentially the “social media platform,” of the show. Today’s apps are “intelligent,” too, enabling attendees to learn about and network with other attendees, take notes, take part in polls, participate in contests and event geo-locate other like-minded attendees. They’re even measuring engagement and what show content attendees were accessing most. Launch apps early to let attendees kick-start their meeting interactions before they arrive. 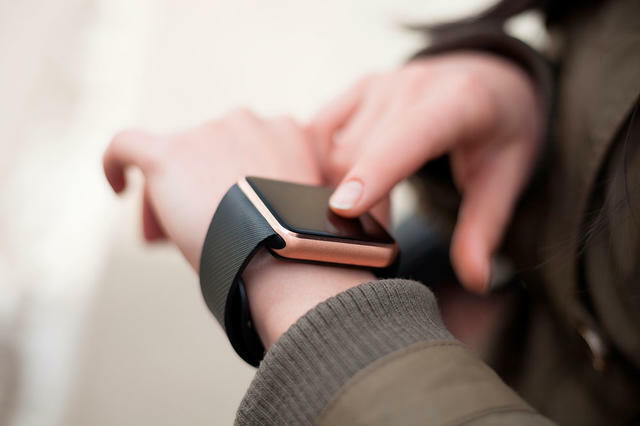 Integrating “passive wearables” into your event strategy, like biometric bracelets, can track bio-data like attendee heart rates and send real-time, physical feedback to organizers on whether a session is working, whether you’re getting attendees excited and whether that excitement is peaking or plummeting. Smart marketers use the data to make changes in real-time to improve the attendee experience. 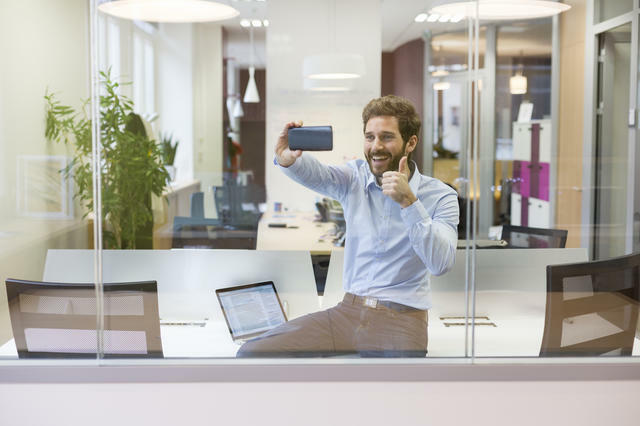 For both virtual attendees and on-demand content, live-streaming connects global offices and attendees who are unable to attend the meeting. And for attendees who were able to physically make the meeting, they can use that live-streaming footage for on-demand content, marketing materials, post-meeting collateral and training. From LED to projection, dazzle audiences with displays that create a multimedia and immersive environment. “We work very closely with production teams on staging and the look and feel of a room, and this year we had a long space covered with LED screens, lighting and video work that was phenomenal,” Curran says. “It really gave a sense of high technology and a sense of what the company is about, and gave attendees that ‘I want to see what’s coming next’ feeling." Your typical virtual reality goggles and activations may seem overwhelming (and expensive) when you’re talking about a meeting with a thousand attendees. 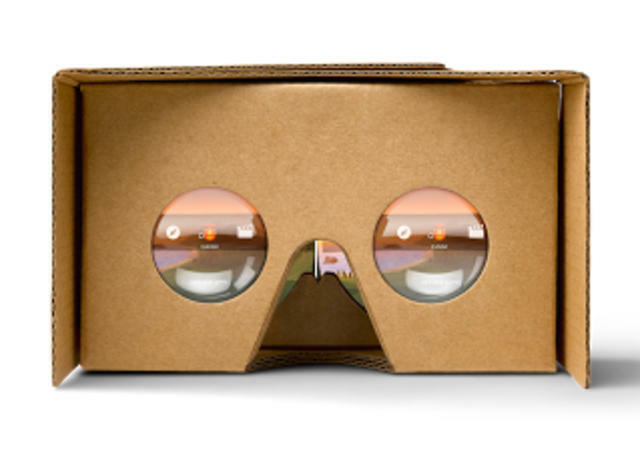 But you can easily incorporate options such as Google Cardboard, where attendees can transform their phones into immersive devices that take them inside destinations or virtual scenarios where the products they’re selling are in use—before, during or after the meeting. Drop a geo-fence around your meeting footprint and install beacons (small silent “proximity” devices) in high engagement areas for frictionless data collection and push notifications. 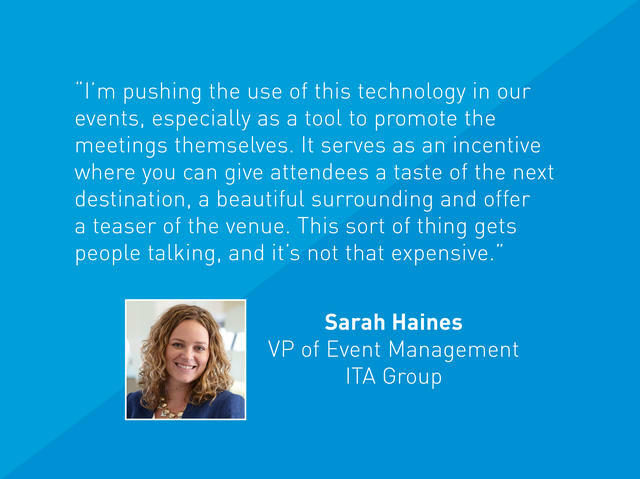 This Bluetooth low energy (BLE) technology has been out for a few years, but some of the biggest meeting and conference planners continue to expand their use. In your sales meetings, instantly push calls to action to attendees when they enter a specific space such as a networking reception with an invite to connect with others around them, an audience poll when they walk into a general session room to simply measure traffic flow. juggling screens while watching television and working. The “second screen” is a way of life, and it can be a strategic additional platform to engage attendees in the messaging if you embrace it. Consider providing presentation content ahead of time for attendees to “follow along,” (like a gallery of images or key facts that enhance the keynote), and make sure you’re using that meeting app’s features to its full potential with audience polling and “pulse” checks. 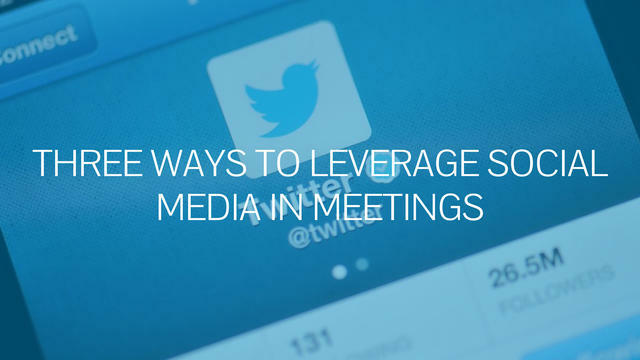 Marketers and meeting planners know the importance of social media as a tool for networking and amplification. But in sales meetings, where private information ranging from specific company strategies to clients and sales numbers is shared, it’s difficult to decide where and how to use it. While a consumer-focused social media strategy might focus on unscripted “moments,” in the b-to-b space, a social media strategy is structured and purposeful. TIP! 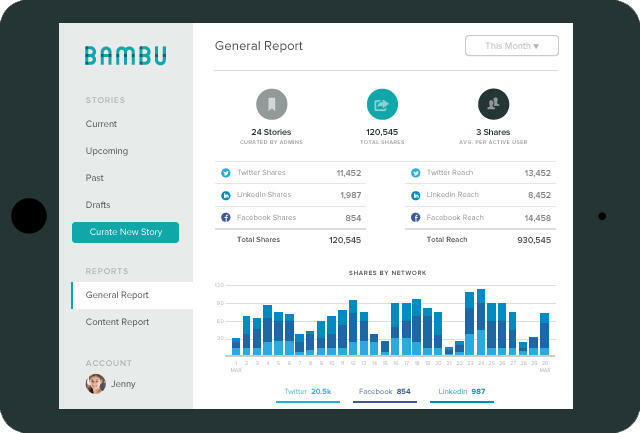 Sprout Social's Bambu is a social media platform built for employee advocacy. It allows a manager to get an entire sales team, or specific channels, on message by loading in content that they want teams to share out on their social media accounts. Bambu also generates leaderboards for rewards and tracking. “Sales people are your best brand ambassadors and advocates out there, that’s what they do—they market for you—they want to use their personal social media channels to talk about the brand, the products, and all they need is the assets and opportunity to it,” Gallegos says. “People like to buy from people who they like, and who are smart, and so interview different people on what they like to do in their personal time; where they’re from, and create an interesting story you build when everyone is already there and engaged,” Gallegos says. 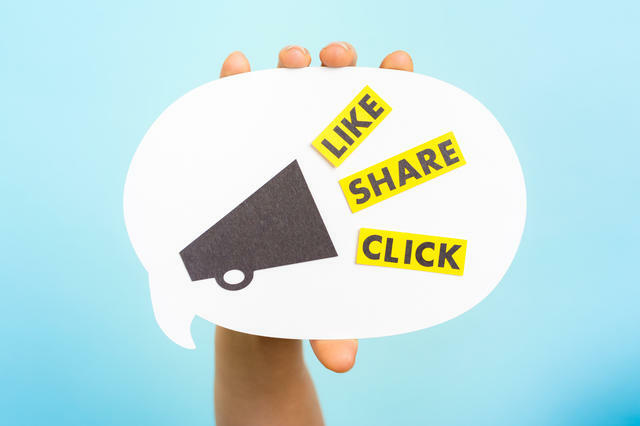 Social media isn’t just for amplifying the event or the brand, it can help positively impact business goals. In the new sales meeting, planners are embracing the wealth of information social media provides, and building into the agenda insights that can help sales reps sell better. “Sales people get spreadsheets and numbers and goals, but they often don’t get the stuff that marketing people get, the customer insights, seeing what customers are sharing on social media and what they’re saying about the brand, so they can learn about their brand from the customer’s perspective,” Gallegos says. What’s a work trip without a little fun? 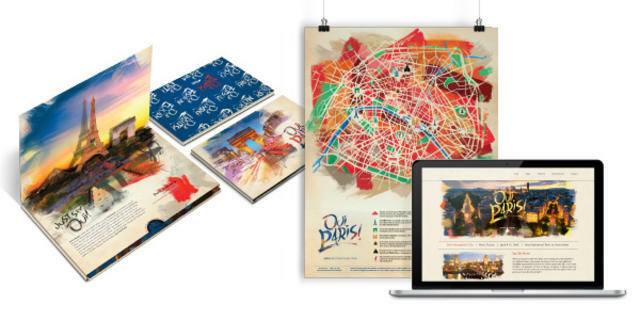 Off-sites and entertainment give attendees the opportunity to explore cities and culture, but no matter how spectacular these opportunities are, they can sometimes feel disconnected from the meeting’s mission. 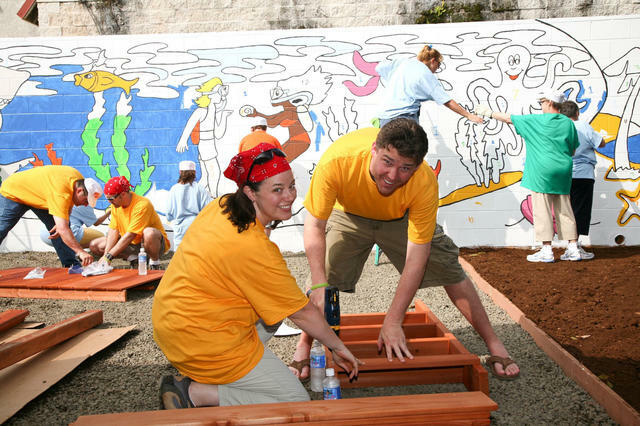 One way to accomplish both goals is through opportunities that fuel collaboration through philanthropic endeavors. Look for local organizations that need volunteers for an afternoon river cleanup with a gorgeous outdoor backdrop or help harvesting a community garden. You can also take it “inside” with meal preparation for homeless shelters or career counseling for students. You can also look for ways to transform your receptions and dinners. Tap into the live theater trend, and transform a dinner or cocktail hour into an immersive performance that’s shareable and participatory. 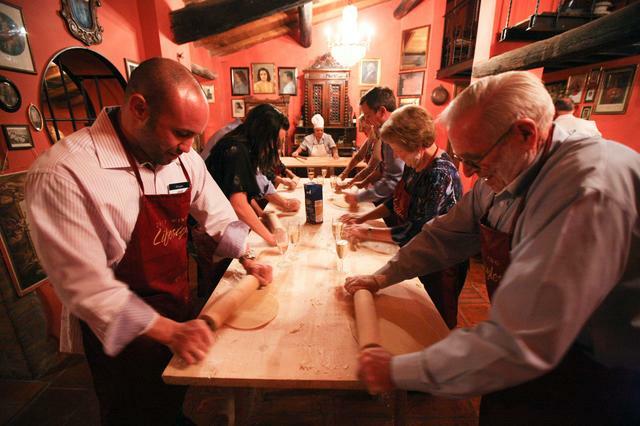 Or bring in a celebrity chef who cooks an entrée on-site or answers questions about their craft. “People want those photos, they want conversation starters, you want them to walk away feeling like they couldn’t have done that without the company or the group,” Gass says. For off-sites, look for trips that bond. Get attendees out into the host city to sight-see and discover experiences together, whether through an in-app scavenger hunt or photo contest. Pair up and divide teams to amplify networking, or, encourage friendly competition among regions. As you develop ideas for “fun,” remember to include key stakeholders, and don’t forget that element of surprise: “The attendees love it and again it creates that emotional connection to their company,” Haines says. Meeting surveys used to be a purely post-event task designed to find out whether an attendee enjoyed the experience and if they learned what you wanted them to learn. 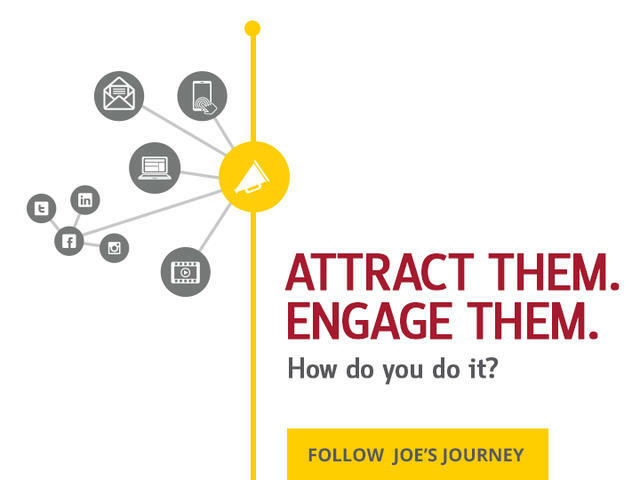 Today, engagement is measured before, during (in real-time) and after the event. Here’s a look at the different approaches. It begins with baseline data. This is especially critical if you’re taking a quantitative approach, which assesses how much knowledge was gained (and later, retained) at a meeting. 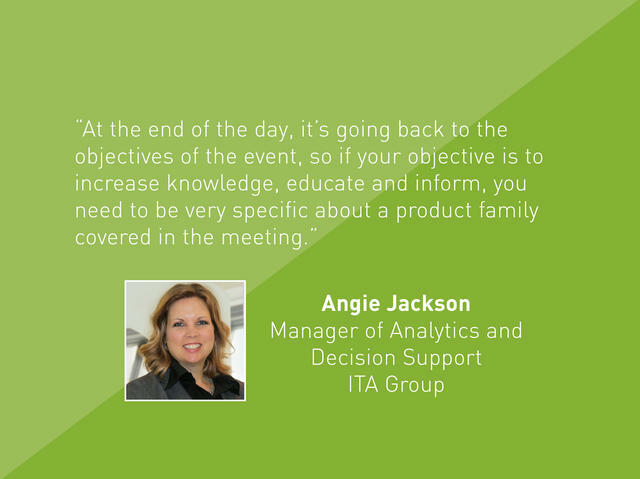 You want to be able to measure a change in education, loyalty and excitement among your attendees With this approach, it’s important to be specific, says Angie Jackson, Manager-Analytics and Decision Support at ITA Group. The new sales meeting takes into account real-time attendee feedback, through in-app polling or biometrics to gauge the physical response of a speaker and the content. “When you talk about the future of surveys, we talk about helping to design the pre- and the post-event, but also it can just be one or two questions throughout the event itself. You’re getting that live ongoing perspective and if you find out through polling throughout the event what people found most valuable, or were not as clear on, then you can use that in your closing remarks and bring it back together,” Jackson says. 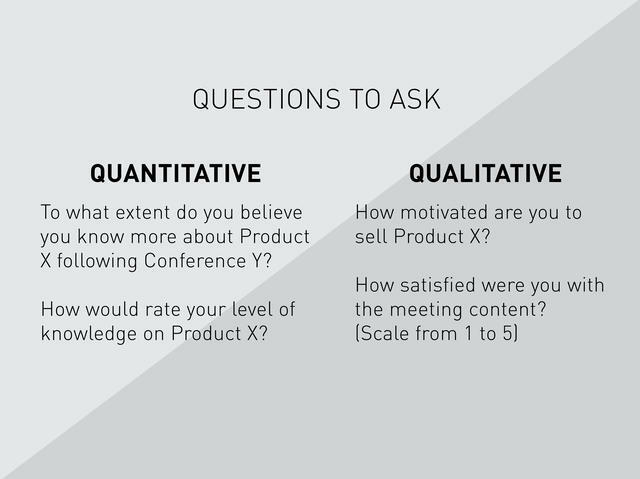 This is where your quantitative approach returns through post-event quizzes, an analysis of sales numbers, measuring increases in meetings for a product attendees were trained on, or measuring downloads of marketing materials. You want to assess how much knowledge was retained and follow up with attendees a couple of days after the event and then, three months after the event. But don't forget to leverage qualitative data, which is feedback, surveys and open-ended questionnaires. "It's how you get underneath perspectives of how the participating audiences felt about the program, the event or activity, and how satisfied they were," Jackson says. And finally, don’t forget to ask questions about the event experience itself. Sometimes, these can offer specific clues as to how well attendees were engaged in the details, and how well they absorbed the branding and the message. “For me, that’s always the most valuable way to get results is to get the participant perspective on whether the event was worth attending, was it motivating, did it inspire them, how was the venue—because those are all really important things as well," Jackson says. "You can do a great job with content and speakers, but if the beds weren’t comfortable and the food wasn’t good, that’s going to impact their entire experience." recognition programs that align and motivate your people. 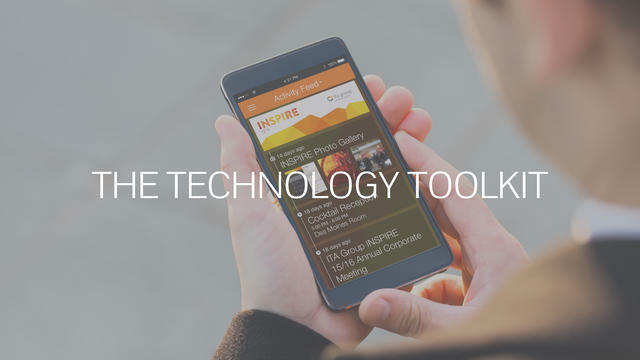 Get Instant Access to the Trends and Technologies Reshaping Sales Meetings! Complete the quick form below.